Mold allergies; What are the common symptoms? Mold allergies are inappropriate hypersensitivity reactions to airborne mold spores that when inhaled produce symptoms. There symptoms include coughing, sneezing, headaches, sinus pain, fatigue, itchy watery eyes, post nasal drip, chest constriction and wheezing; and, in some cases when it effects the brain, it can also adversely impact mood, memory and behaviour. Unlike many other environmental allergies, mold is a non-seasonal allergen like dust or dust mites. Ventilation & air conditioning systems. As these molds grow, a stage is reached when they start producing spores and the spores become airborne after drying out or being disturbed. And while most mold allergies are generally not deadly, increased exposure to airborne mold spores can make the symptoms worse. And so, over time, the attacks can become more severe. Both mold and mildew are a type of fungi and there are many different types, but they all grow best in a damp or a humid atmosphere, indoors and out doors. Can airborne mold spores be dangerous to your health? 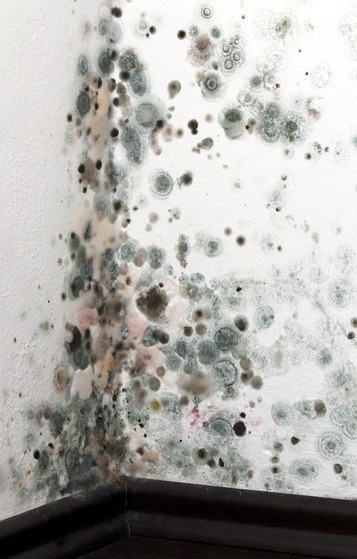 About 20% of the population is allergic to mold spores. Apart from being allergenic, spores of some mold species such as Stachybotrys contain toxic compounds called mycotoxins which can produce a wide variety of symptoms ranging from simple upper respiratory allergies to pneumonia and asthma. Young children, the elderly and individuals with compromised immune systems and people undergoing medical treatments are particularly suseptable to mold spores allergies and diseases. You should not live in a mold infested house or work in a mold infested office; and if you suspect airborne mold problems, get professional help from a qualified mold expert. If you live in the Charlotte area, I can recommend Inspector David Snell at Executive Restoration and his website is http://www.executiverestoration.com/ office phone 704-545-0098 and cell: 704-905-9152. Otherwise go to www.NORMI.org to find a certified professional in the mold industry, they will refer you to a nearby mold inspector or remediator. It is important before you buy a new home to get it tested for mold and mold spores. This is especially true if it has been in foreclosure, bank owned or left empty for long periods without air conditioning. Before renting or leasing a home, check with the landlord to make sure there is no mold especially again if it was a foreclosed or bank owned. Allergic Fungal Sinusitis. This is a common type of fungal infection in the sinuses that can cause significant swelling, inflammation and even infection in the sinuses. Allergic Rhinitis. Which is the name of a condition in which the fungal spores irritate and inflame the mucous membrane lining the sinus cavities. In severe cases, fungal balls called mycetoma can develop. They vary in size and are usually blackish green in color. Chronic invasive sinusitis can then develop that can actually erode the ethmoid sinuses. Asthma is often associated with this condition. This may require surgical intervention in some cases. Mold can secrete toxins called mycotoxins; and when inhaled repetitively, they can impair the immune system and produce a disease called mycotoxicosis. These mycotoxins can become allergens and then should be treated by an holistic allergist along with the primary mold allergy. Who is at risk of developing fungal/mold allergies? Persons living in a house with too much airborne mold. Persons chronically exposed to moldy materials at their work place. For example, wine and beer makers, bakers, loggers, wood cutters, green house care takers, artists who work primarily with clay, etc. First remove the mold from the environment. Contact NORMI their toll free number is 1-877-251-2296. Get a high quality air purifier to minimize mold spores and their toxins in the air. When necessary wear a mold mask. Eliminate areas of dampness and all water leaks in your house or office; and reduce humidity under 70% with a dehumidifier, if necessary. Consider ozonating your house this must be done by a professional for safety reasons and all animals plants have to be removed from the house or buying a photocatalytic oxidation unit. Utilize safe homeopathic drainage remedies and specific nutraceuticals to support the lungs, lymphatics and sinuses, for mold & fungi spores in your body. Last but not least, you should get desensitized to the particular species of airborne mold or fungi by an expert in this area as well as their mycotoxins.